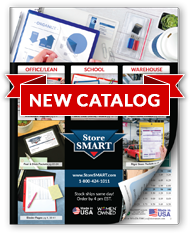 StoreSMART's Rigid Print Protectors with Easel Backs give your posters, menus, and photos the protection they deserve! Each rigid-edged protector is crafted of clear, "non-migrating" PVC vinyl that contains no plasticizers or stearates, which means they won't harm your beloved collectibles or important work documents. Help your favorite prints retain their value while they're being displayed or stored—and protect them from everyday disasters such as dust, water, and exuberant children—by pulling them out of their envelopes and paper tubes and sliding them into one of our professional print protectors. With the easel back attached to the back, your photos, posters, and menus will really stand out! Protect workplace safety posters from staining and fading. Or join hundreds of successful restaurants by using our protectors to house menus. No matter how you choose to make use of them, your important materials will be safe and sound. Made of clear, high-impact 16 mil PVC vinyl with a 40 mil opening. Overall size: 11 7⁄16" x 17 ¼". Inside capacity: 11" x 17". Open on the short side. 10" Easel back attaches in either portrait or landscape mode. White or black easel. Color may vary. Application is simple and fast! First just fold to assemble. Then just peel off to expose the self-stick (pre-taped) permanent adhesive strips. Center and firmly press onto your frame. No messy glue or tools needed! Rigid for ultimate protection. Reusable. Proudly sold by an American woman-owned company. Ships flat: Easel back comes flat for easy mailing. Restaurants: Use our Rigid Print Protectors to create beautiful menus that can be changed in an instant. Since they can be wiped down, you'll save money on reprinting—and your menus will always look fresh and crisp. Art Lovers: Our rigid protectors make preservation and display a breeze. Enjoy your art, while protecting it from the elements! Businesses: Use our rigid protectors to create visual management displays and to post vital information (such as safety posters) where employees can see it. Teachers: Use them to display children's artwork, or to protect educational prints as you display or use them within the classroom.